Home » Kia Sorento » Check out the updated 2019 Kia Sorento! Check out the updated 2019 Kia Sorento! The Kia Sorento has been updated for the 2019 model year, with new features inside and out that give it a more refined, sophisticated look. Let’s take a look at some of the Sorento’s new features and updates! Read More: What’s the difference between the Kia Sportage and Kia Sorento? The Sorento remains stylish and sleek on the outside, with sweeping lines and a bold front fascia. It has a tighter, sharper appearance with a more detailed grille and new headlamp configuration, offering full-LED lighting on higher trim levels. A new front bumper also adds aggression and completes the front fascia. The rear of the Sorento has also been given a new bumper design, sleeker taillamps, sportier muffler and updated liftgate. New wheel options help give the Sorento a smooth ride, and range from 17 to 19 inches. 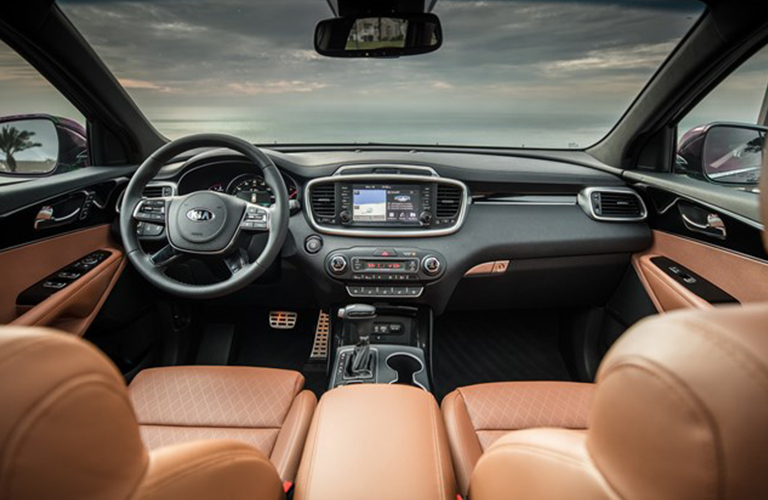 The Sorento’s cabin remains spacious and comfortable. Now standard on all trim levels is 7-passenger 3-row seating. A new steering wheel, shift knob, and revised instrument cluster create a more fluid interior look and add style. The second-row seats have standard 40/20/40 folding options, while third-row seats have 50/50 split-folding capabilities, allowing you to customize your passenger and cargo space to fit your needs. Newly available seat colors on SX and SXL trims are Mahogany and Terracotta, respectively, and updated accent trims are available across all trim levels. An upgraded AVN 5.0 navigation system is available on the 2019 Sorento and Apple CarPlay and Android Auto are available as well. A new Harman Kardon® branded stereo system with an 11-channel amplifier includes Clari-Fi technology2, which works in real-time to create a crystal-clear sound. The base trim, L, comes standard with a 7-inch display interface, and a new available wireless charging tray lets you keep your phone charged without the mess of cords. More information about the 2019 Kia Sorento, including its release date, will be posted as soon as we have more details. Stay tuned to the Palmen Kia blog for more information! Is the 2019 Kia Sorento or 2019 Kia Stinger the More Powerful Model? This entry was posted on Friday, April 6th, 2018 at 12:36 pm	and is filed under Kia Sorento. You can follow any responses to this entry through the RSS 2.0 feed. You can skip to the end and leave a response. Pinging is currently not allowed.